Have your fortunes revealed as you travel through the golden sands of the Egyptian deserts and you might just find plenty of riches in your future. Click here to play! You’re heading to Egypt in an online slot adventure; keep your eyes peeled for the Egyptian cityscape on the horizon. This golden symbol not only holds the top payout of up to 4000 times your line bet, but it will also substitute for all other symbols in the game. Once you’ve found the city, you’re sure to run across plenty of colorful characters wandering the streets. The Egyptian fortune teller will payout up to 1500 times your line bet if you can spin two to five of her symbol across an active payline. There are also camels, rugs, jewels, slippers, lamps, and swords to help you amass your fortune. Watch out for sandstorms as you trek across this golden land. These hazardous conditions may spell trouble anywhere else, but in Super Mystic they are a scatter symbol. Spin two or more anywhere on the board to multiply your total bet. Spin three or more and you will trigger a number of free spins. 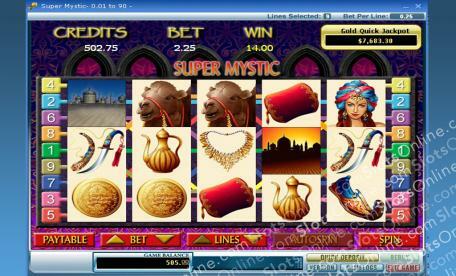 Explore the Egyptian deserts and you may just uncover a fortune in this online slot adventure. The thundering sandstorms are a scatter symbol. If you can spin two or more anywhere on the board, you will multiply your total bet by up to 100. If you spin three or more anywhere on the board, you will trigger a free game feature in which all prizes are tripled. The Egyptian landscape is a wild symbol. Spin one or more across an active payline and you will win up to 4000 times your line bet. It will also substitute for all other symbols, excluding scatters, to help you bring in more winning lines.